By 2020, client centric experience will surpass both price and product as key differentiators. Following the global financial crisis of 2008, financial services firms have been in recovery mode, at best. They have been forced to focus on regulatory issues, compliance, risk management and trimming their costs in line with flat or reduced profitability. As a consequence, many institutions have been distracted from truly understanding their clients and delivering value to them. Herein lies a major opportunity. Progressive financial services firms will recognise that client experience will soon become the main differentiator to gain advantage, nurture a trusting and loyal client base, and generate significant value for their firms. However, capitalising on this opportunity will not be straightforward. For a start, financial services firms suffer from a lack of trust by their clients and lag far behind other sectors in terms of being client centric. For example, research shows that technology companies earned a trust factor of 76, compared with a lowly 54 for financial services firms. Speaking of technology firms, they represent the new threat to established financial services incumbents. Both start-ups and well-capitalised technology firms are focused on disrupting the financial services sector and are attracting increasingly significant capital investment. If incumbent financial services firms do not repair the damage and build trust with their clients, then new entrants will ultimately fill this gap. So how can financial services firms start to move in this direction? It begins with a C-suite commitment to becoming a truly client centric firm. In financial services firms, which are typically hierarchical, only the top executives can orient the firm to commit to become client centric with related clarity on aspirations, firm positioning, and specific client centric and value creation goals. The journey to becoming client centric is multi-faceted, and extends well beyond simple top executive commitment, to include multiple elements, such as client engagement models, client economic analysis, and supporting structures, capabilities and technologies. Understanding the major elements that collectively need to be in place to become client centric and how these elements need to inter-relate and support one another is the second most significant challenge to becoming client centric. For further insight and evidence supporting the views in the article, please refer to our attached paper title “The Lost Decade of Client Centricity”. 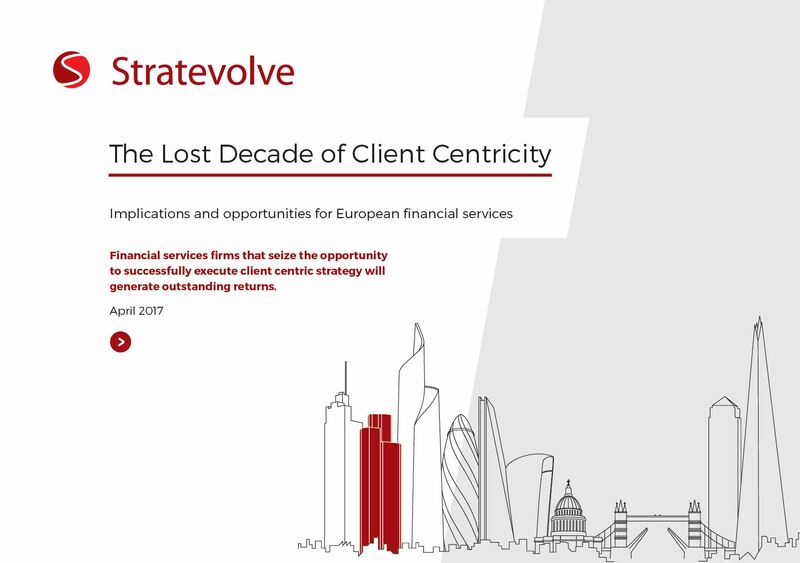 This paper also provides an introduction to the Stratevolve’s Client SiteTM Framework which draws on genuine client insights to inform the many elements required for a firm to become truly client centric and capture significant value. Contact Stratevolve to discuss how our Client SiteTM Framework can accelerate your firm’s thinking on how to become more client centric.